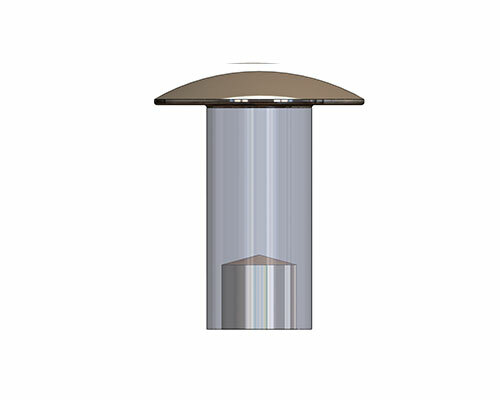 Semi-tubular rivets can be designed specifically for the application to achieve optimal functionality. Custom length, head diameter, and body diameter configurations are possible, along with alternate materials/platings. Please provide the application details for us and we will work with your engineering team to design a rivet to work for your application. RIVETKING® Semi Tubular Rivets are manufactured in accordance with internal standards and coated with a proprietary wax to ensure a smooth rollover and clinch of the assembly. To calculate the rivet length, add the material thicknesses to be riveted to the maximum clinch allowance “CA”. The resulting value is the maximum allowed rivet length. Round off to the nearest 1/32” not exceeding the maximum allowed rivet length. 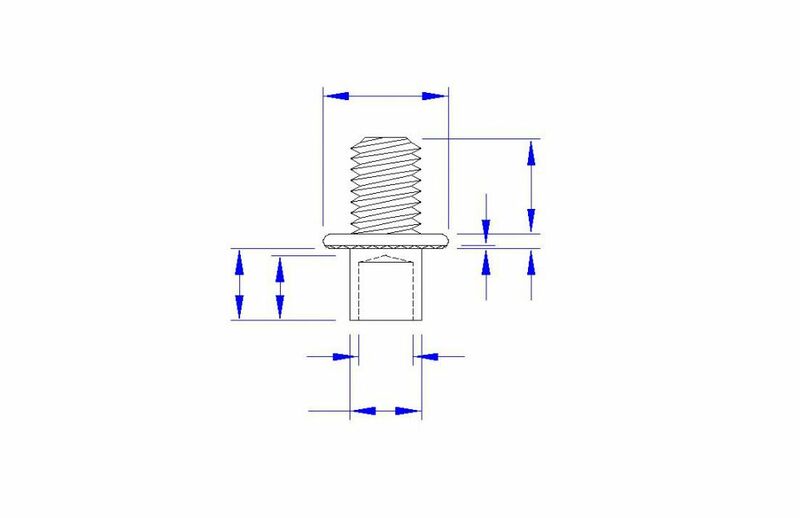 The standard Semi Tubular Rivet is made of 3 major components with 6 dimensional values, all of which are required in order to produce the rivet. 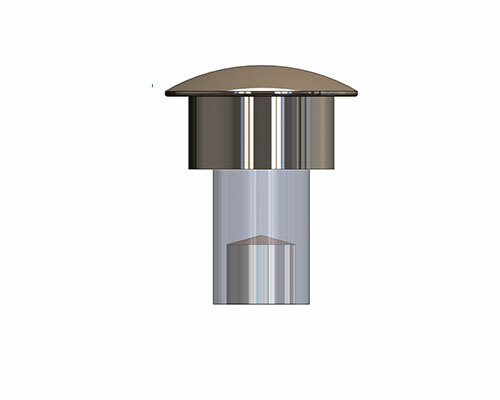 Custom rivets are sometimes produced with an additional component called a “shoulder”. In this case, additional diameter and length dimensions are required for each shoulder. 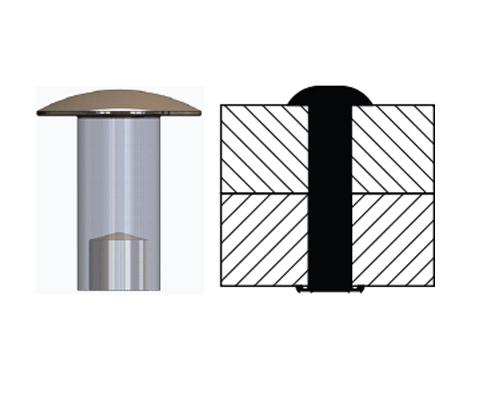 Rivets can be made with multiple shoulders, however, it is suggested that Semi Tubular rivets be designed with only one shoulder. When a shoulder rivet is required, the hole depth should not extend into or past the shoulder, as this causes problems in the manufacturing process and may adversely affect the functionality of the rivet. A portion of the rivet length is required for clinching the Semi Tubular rivet. As a general rule of thumb this is usually figured at about 55% of the rivet diameter. Because rivets have been standardized, we have calculated the required clinch allowances for standard rivets in the table below. Tolerances should be considered as actually representing degree of error. Designs should start with zero tolerance (allowable error) being made only to fit the product designs into the manufacturing process. Many mechanical failures of product designs can be avoided. For example, the holes in two pieces to be assembled are deliberately made oversized so there will be no question of the rivet going through. However, these two pieces rotate separately around the rivet. Because of the sloppiness in the hole, an eventual elongation of the hole occurs resulting in the malfunction of the assembly. This is one of the most common oversights occurring in product designs. Sufficient clearances must be provided in all directions so that riveting equipment is able to get the rivet into the work piece for proper clinching. Axial access for clinching must be available both above and below the hole through which the rivet must pass. Clearances vary depending on the configuration of assembly, the thickness of assembly and the length of the rivet. Usually the smaller the rivet the less the clearances are required. As a general rule, the minimum hole clearance is .003” and the maximum is .008”. When one rivet is set in an assembly, the minimum should be observed to assure the strongest clinch possible. If the two or more holes on an assembly are being set with rivets, clearances on the maximum side should be used. The amount of clearance depends largely on the ability of your production equipment to maintain close center to center hole location tolerances on the mating part to be riveted. There are two types of settings that are normally used in the clinching of Semi Tubular rivets; the Roll Clinch and the Scored Clinch. A Rolled Clinch gives the maximum strength when the rivets are set properly. When this clinch is used with soft materials, washers, (burrs) or caps will provide more bearing surface and a stronger clinch. A Scored Clinch holds best on soft materials since it can be turned into the material and spreads the clinch to provide a greater contact bearing surface. The corrosion factor of a particular rivet is dependent on the corrosion of the base metal, the protection layer (plating) and the conversion layer (chromate). Being that the most cost effective material to produce is steel, most prefer to protect the steel with a plating such as Zinc and a chromate. Rivets require a specialized plating and wax therefore it is highly suggested the manufacturer perform this task. For standard performance a SST rating (salt spray test) is about 48 hours until red rust. Other platings such as Zinc alloys (i.e. ZiNi, ZnFe and ZnTi) can extend the SST rating to 840 hours until red rust. Our in-house test facilities can test the rivet before and after setting according to the ASTM B117 standard. Galvanic Action is seldom considered in design but it can often be one of the hidden causes of failures. Galvanic corrosion is accelerated electromechanical corrosion created when a noble metal is in contact with another less noble metal, both being in a corroding medium (such as damp air). The less noble metal corrodes at a faster rate than normal while the noble metal acquires greater protection of corrosion. For example, an Aluminum (less noble metal) rivet in a copper (more noble metal) would cause aluminum to corrode at an accelerated rate while the copper would be virtually un-affected. Should you be in a position of having to join two dissimilar metals, be sure to refer to the Galvanic Series table. For some applications Semi Tubular rivets can be used without the need for preformed or pre-drilled holes. Semi Tubular self-piercing rivets can be used with materials such as leather, some plastics, and light sheet metals. When piercing sheet metal, adjustments may be suggested to the rivet raw material, hole diameter and heat treatment. Self- piercing rivets can be used especially in difficult spot welding applications, piercing and fastening in just one step. They have excellent mechanical strength and fatigue performance. Since Semi Tubular self-piercing rivets can be automated, you can expect highly repeatable results.